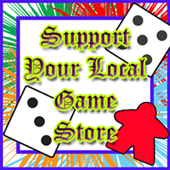 Flaming Dice Reviews | Reviews, Videos, and Articles about Board and Card Games! 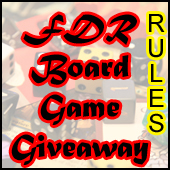 Reviews, Videos, and Articles about Board and Card Games! Review of the upcoming Kickstarter game, Moonshine Run by Games for a Madman or Two! January 13, 2017 in Card Games. January 12, 2017 in Board Game News. January 11, 2017 in Board Game News, Kickstarter Preview. January 4, 2017 in Stay on Target. December 30, 2016 in Strategy Games. Review of Hand of the King, a small box card game by Fantasy Flight Games and Bruno Cathala. In Hand of the King players maneuver Varys through a grid of character cards, attempting to gain the loyalty of the 7 most powerful houses of Westeros. December 10, 2016 in Video Review. December 8, 2016 in Dice Games. December 3, 2016 in Card Games. November 29, 2016 in Kickstarter Preview. November 24, 2016 in Dice Games. November 15, 2016 in Board Game News. Enter your email address to follow FDR and receive notifications of new posts by email! Click here to vote up FDR! Click the picture to visit mine!